Magnolias for winter interest? Have I lost my mind? This is a thinking out of the box series, remember, about rather typical plants in atypical settings–in winter without snow (although it goes without saying, I hope, that all of these plants would also look good in a winter where there is snow on the ground. In fact, since the post was drafted, a bit of snow has fallen, so you can see for yourself that the trees do look good with snow on the ground). And as we tend to have winters without snow more often–or as winters with less consistent snow cover become more normal–what we will need are plants that are going to be able to look good under those conditions. Planting for climate change usually means planting native plants. 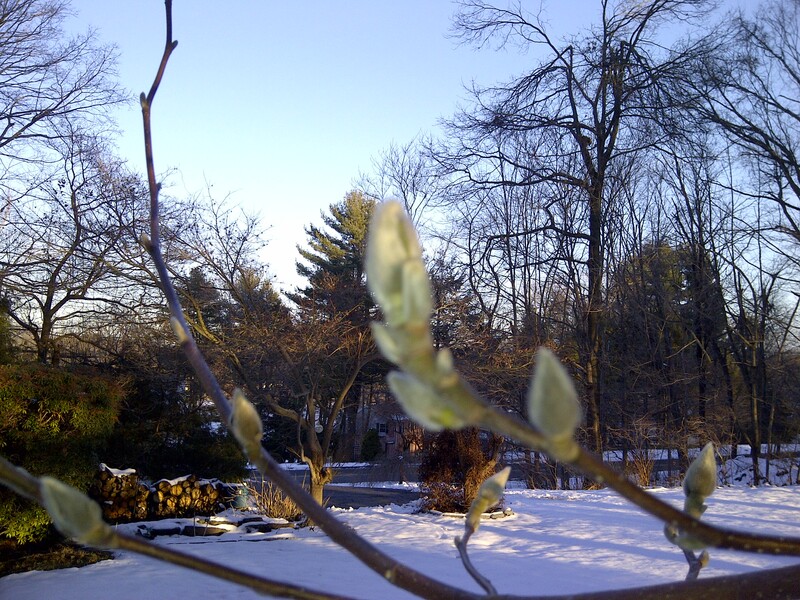 Unfortunately, many native plants do not look fabulously showy in a drab winter landscape. I’m a huge proponent of natives and do try to plant them whenever possible–but that’s a different post for a different time. Would it surprise you to know that there are many native magnolias? None is native to Connecticut but some are native as far north as New York state. Of course, it is rare that homeowners are planting those varieties but they could if they had a native plant nursery near them. What’s great about magnolias are their fat and sassy buds. 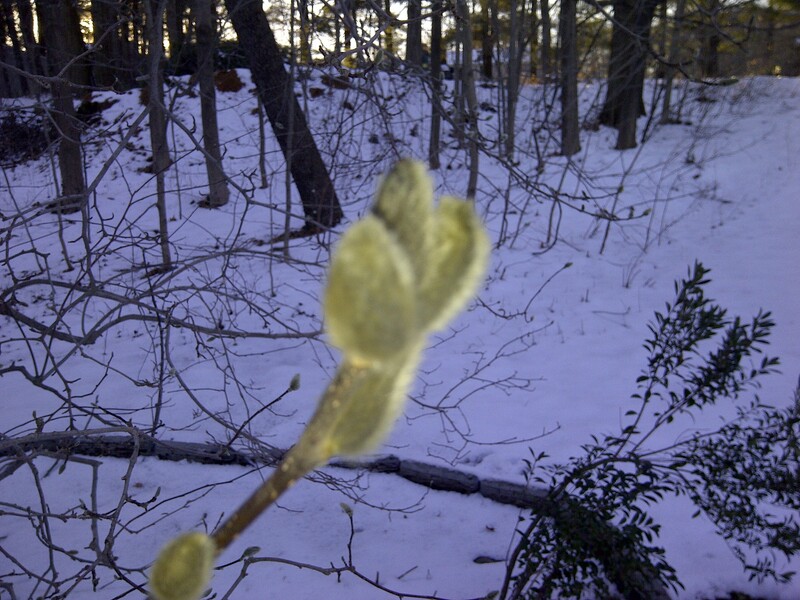 They set these buds in the fall and hold onto them until the earliest warm spring days. In fact, that’s almost their downfall–some get tricked into blooming a little too early and then the cold weather returns and the flowers turn to mush. But the buds are on the trees from late summer or early fall–even in drought years, I find–until those warm spring days, providing a glorious diversion. If you don’t mind parting with a few flowers–or if the tree is getting unruly and needs a good haircut–you could do a little pruning and take some of the branches indoors to force the buds into an even earlier bloom. This is just about the right time to do that in my part of the world.